Pyrobots are Ready-Bots that appear in Donkey Kong Country Returns. 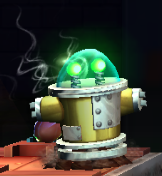 As their name states, Pyrobots use flamethrowers, which can hurt Donkey Kong and Diddy Kong. Pyrobots come in two models. The red, older Pyrobot Mk I (also spelled Pyrobot Mk 1) is resistant to every kind of direct attack that the Kongs make. However, jumping on one can immobilize it temporarily. The only way to defeat a Mk 1 is to throw a barrel or a BuckBomb at one. The yellow, newer-looking Pyrobot Mk II is less durable and can be jumped on three times to be defeated. Mk II can also be taken out with barrels. Both kinds of Pyrobots are only found in the Factory area of Donkey Kong Island. 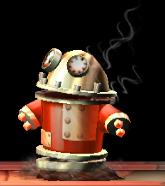 In Donkey Kong Country Returns 3D, the red Pyrobots in Robo Factory shoot fire steams out of their heads while the yellow ones act like normal Pyrobots. ↑ "Ready-Bots" concept artwork, "Critters 2 Gallery" in the "Extras" section of Donkey Kong Country Returns. ↑ "On a platform between two sets of mallets, stun the Pyrobot Mk I and then pound on the container to get another Puzzle Piece." Knight, Michael. Donkey Kong Country Returns Prima Official Game Guide. Page 135. ↑ "Below the N Block, stun the Pyrobot Mk 1 by jumping on it, and then pound a trapdoor to drop into a hidden area." Knight, Michael. Donkey Kong Country Returns Prima Official Game Guide. Page 135. ↑ "Jump to the platform to the right, and knock off the Pyrobot Mk II." Knight, Michael. Donkey Kong Country Returns Prima Official Game Guide. Page 131. This page was last edited on March 31, 2019, at 14:47.